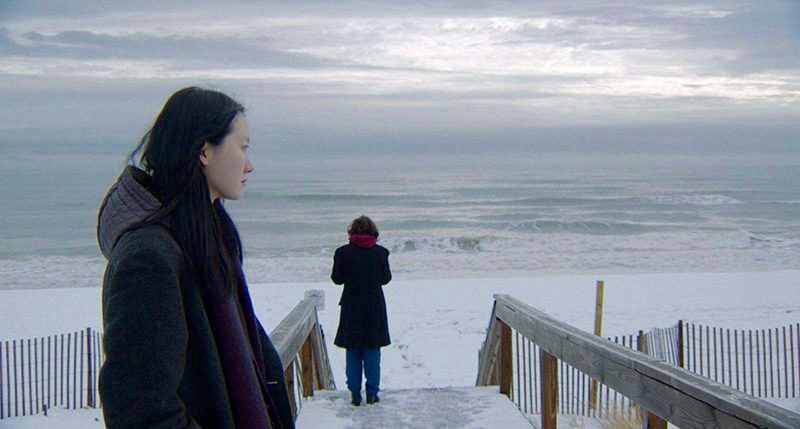 Tenderly told and visually sublime, Joanne Mony Park’s Fish Bones closely follows Hana (Joony Kim), a Korean immigrant living in New York City, during her winter break. With her brother, she works in a Korean barbecue restaurant and takes turns tending to their mother. Like many immigrants, she’s caught between two forces: On one side are her familial duties and her conservative mother’s expectations; on the other, her dreams of modeling and a new love with the sweet Nico (Cris Gris), a Latina music producer. Like its story, Fish Bones is a quiet and gentle film, composed almost entirely of long, polished takes, each striking in its subtle and meticulous allure. Hana and Nico’s story unravels piece by piece in a nonlinear fashion, but watching the film doesn’t feel so much like a slow burn or jigsaw puzzle as it does a submersion, a dip in the pool. Each of Fish Bones’ long takes almost feels like an exercise, exploring just how much can be conveyed or imparted within a fixed frame. Hana and Nico lie in a sun-drenched bed, teaching each other phrases in Korean and Spanish. They converse quietly and stroll along a wintry beach. They listen as a singer works her magic in Nico’s studio. Plenty of shots fixate on one person, and one person only, and we watch closely as they interact with the world beyond the frame (and maybe within themselves): Hana as she loses her breath dancing in a karaoke room, Nico as she meets a woman for a first date, Hana in her bedroom as she admires her reflection in the mirror. And finally, there are shots to indulge in: In one, we watch as Hana and two other models spin on a pedestal, adjusting for the camera and reacting to being watched as their backdrop changes from one over-bright color to the next. Another shot adds some levity, with Nico’s friends and family gathering at a table to eat, the camera spinning continuously at its center as they pour wine, make conversation and laugh together. Preceded by animated short Mak (USA), directed by Natalya Serebrennikova.